Q – What is Die Casting? A – Die casting is a manufacturing process for producing accurately dimensioned, sharply defined, smooth or textured-surface metal parts. It is accomplished by forcing molten metal under high pressure into reusable metal dies. The process is often described as the shortest distance between raw material and finished product. The term “die casting” is also used to describe the finished part. The term “gravity die casting” refers to castings made in metal molds under a gravity head. It is known as permanent mold casting in the U.S.A. and Canada. What we call “die casting” here is known as “pressure die casting” in Europe. How Are Die Castings Produced? Hot chamber machines (Fig.1) are used primarily for zinc, and low melting point alloys which do not readily attack and erode metal pots, cylinders and plungers. Advanced technology and development of new, higher temperature materials has extended the use of this equipment for magnesium alloys. In the hot chamber machine, the injection mechanism is immersed in molten metal in a furnace attached to the machine. As the plunger is raised, a port opens allowing molten metal to fill the cylinder. As the plunger moves downward sealing the port, it forces molten metal through the gooseneck and nozzle into the die. After the metal has solidified, the plunger is withdrawn, the die opens, and the resulting casting is ejected. Hot chamber machines are rapid in operation. Cycle times vary from less than one second for small components weighing less than one ounce, to thirty seconds for a casting of several pounds. Dies are filled quickly (normally between five and forty milliseconds) and metal is injected at high pressures (1,500 to over 4,500 psi). Nevertheless, modern technology gives close control over these values, thus producing castings with fine detail, close tolerances and high strength. Figure 1: Hot Chamber Machine. Diagram illustrates the plunger mechanism which is submerged in molten metal. Modern machines are hydraulically operated and equipped with automatic cycling controls and safety devices. Cold chamber machines (Fig. 2) differ from hot chamber machines primarily in one respect; the injection plunger and cylinder are not submerged in molten metal. The molten metal is poured into a “cold chamber” through a port or pouring slot by a hand or automatic ladle. A hydraulically operated plunger, advancing forward, seals the port forcing metal into the locked die at high pressures. Injection pressures range from 3,000 to over 10,000 psi for both aluminum and magnesium alloys, and from 6,000 to over 15,000 psi for copper-based alloys. In a cold chamber machine, more molten metal is poured into the chamber than is needed to fill the die cavity. This helps sustain sufficient pressure to pack the cavity solidly with casting alloy. Excess metal is ejected along with the casting and is part of the complete shot. Operation of a “cold chamber” machine is a little slower than a “hot chamber” machine because of the ladling operation. A cold chamber machine is used for high melting point casting alloys because plunger and cylinder assemblies are less subject to attack since they are not submerged in molten metal. Figure 2: Cold Chamber Machine. Diagram illustrates die, cold chamber and horizontal ram or plunger (in charging position). Die casting dies (Fig. 3) are made of alloy tool steels in at least two sections called fixed die half and ejector die half. The fixed die half is mounted on the side toward the molten metal injection system. The ejector die half, to which the die casting adheres, and from which it is ejected when the die is opened, is mounted on the moveable platen of the machine. The fixed die half of the die is designed to contain the sprue hole through which molten metal enters the die. The ejector half usually contains the runners (passage ways) and gates (inlets) which route molten metal to the cavity (or cavities) of the die. The ejector half is also connected to an ejector box which houses the mechanism for ejecting the casting from the die. Ejection occurs when pins connected to the ejector plate move forward to force the casting from the cavity. This usually occurs as part of the opening stroke of the machine. Placement of ejector pins must be carefully arranged so force placed upon the casting during ejection will not cause deformation. Return pins attached to the ejector plate return this plate to its casting position as the die closes. Fixed and moveable cores are often used in dies. If fixed, the core axis must be parallel to the direction of the die opening. If moveable, they are often attached to core slides. 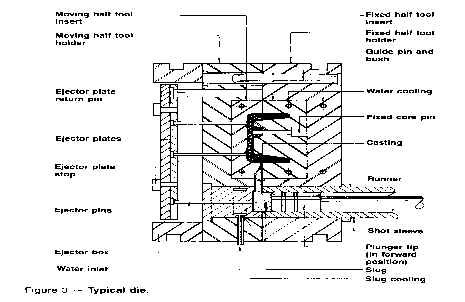 Should the side of a die casting design require a depression, the die can be made with one or more slides to obtain the desired result without affecting ejection of the casting from the die cavity. All moveable slides and cores must be carefully fitted, and have the ability to be securely locked into position during the casting cycle. Otherwise, molten metal could be forced into their slideways causing a disruption of operations. Although slides and cores add to the complexity and cost of die construction, they make it possible to produce die castings in a wide variety of configurations, and usually more economically than any other metalworking process. Sprue holes are tapered with the small end located at the breaking point when the die is opened. A sprue pin, located in the ejector half, makes the sprue hollow and deflects metal entering the die into the runner system. Runners are channels located at the parting line to route liquid metal from the sprue hole to the gate. Gates are passages through which metal enters the die cavity. They have an important function in directing metal flow so that the cavity is correctly filled. Air is expelled through vents as molten metal enters the die cavity. Guide pins assure proper alignment of die halves and correct register of cavities. Side walls and cores are designed to have a slight taper or draft. The largest diameter or cross section of a cavity must be located at the parting line (unless slides are used) so the casting can be removed from the die. As molten metal in a die cavity solidifies, it shrinks away from walls onto core pins and other projections. The design of the die must permit withdrawal of core pins, and ejection without applying too much pressure which could cause deformation to the die casting. Cores, fixed or moveable, as well as “loose pieces,” must be positioned to facilitate removal either mechanically or by hand. Loose pieces used to form undercuts must be positioned by the operator. This requires extra labor, and usually slows the casting cycle. Inserts can be cast integrally to provide special characteristics. Dies are classified as: single cavity, multiple cavity, combination and unit dies (Figures 4-A to 4-D). A single cavity die requires no explanation. 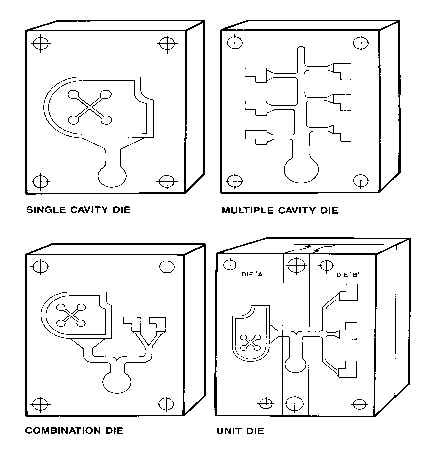 Multiple cavity dies have several cavities which are all identical. If a die has cavities of different shapes, it’s called a combination or family die. A combination die is used to produce several parts for an assembly. For simple parts, unit dies might be used to effect tooling and production economies. Several parts for an assembly, or for different customers, might be cast at the same time with unit dies. One or more unit dies are assembled in a common holder and connected by runners to a common opening or sprue hole. This permits simultaneous filling of all cavities. “Automation and Mechanization” are terms often used interchangeably by the die casting industry. Automation of a manufacturing process is more sophisticated and complicated than the mechanization of various operations. Die lubrication can be accomplished by installing fixed or reciprocating spray systems. An automatic ladling device can replace the hand ladle. Castings can be removed from the die by extractors or robots, or by “drop through” to a conveyor below the machine. Die casting machine operation can be integrated to cast, quench, trim and eject castings and return scrap to the furnace by conveyor. By closing the loop, the die casting process can be automated, utilizing feed-back controls and microprocessors which automatically self compensate for process variables. As die casting plants move toward automation, noticeable changes occur. The operation tends to become safer. Production and quality improves considerably. Automation upgrades the labor force by requiring the development of new skills for machine set-up, programming, electronics, mechanics and maintenance. Quality in die casting is maintained through the use of process controls and feedback between the process control computer and the die casting machine. Process controllers may utilize microprocessors to access transducers mounted on the die casting machine, to obtain velocity, position, hydraulic pressure and tie-bar strain data, etc. The microprocessor then adjusts the die casting machine operation through special valves, thus assuring consistent castings shot after shot. The process controller also collects machine performance data for statistical analysis in quality control. Step 1 — Alarm monitoring — A computerized remote terminal mounted near the die casting machine continuously monitors the following: velocity, position, pressures at the accumulator, die lock-up cylinder, head and rod side of the injection cylinder, temperatures of hydraulic oil, metal (up to ten locations in the die), and strains on four tie-bars. Each of these variables is high/low limit checked every shot. An alarm is sounded or flashed if a casting variable goes out-of-limits. Step 2 — Control — Automatic control valves and tie-bar adjusting motors are installed on the die casting machine and connected to the computerized remote terminal unit. The computer adjusts controls to maintain satisfactory die locking force, slow shot velocity, optimum fill time and proper intensifier timing. The computer may also be interfaced to a robot and/or a programmable controller. Step 3 — Data acquisition — After installing computerized remote terminal units on each machine, a data acquisition system may be formed by interconnecting these units and communicating all information back to a master terminal computer in the office. The master computer prints out a management information report which summarizes the operation of the entire die casting shop, including which machines are running, when they stop, shots made (good and bad), which machines are out-of-limits and what to do. At the master station, the manager can analyze the process by studying shot profiles on a video monitor and statistical reports from a high speed printer.